Brands are increasingly looking at Instagram to attract new customers. In fact, Instagram is starting to take a larger place in their marketing mix as brands have understood that delivering good visual content to followers has become key to building loyalty among them. However all brands are not as successful on Instagram and it might be an industry thing as well as a seasonal one. So which industries are doing this the best? 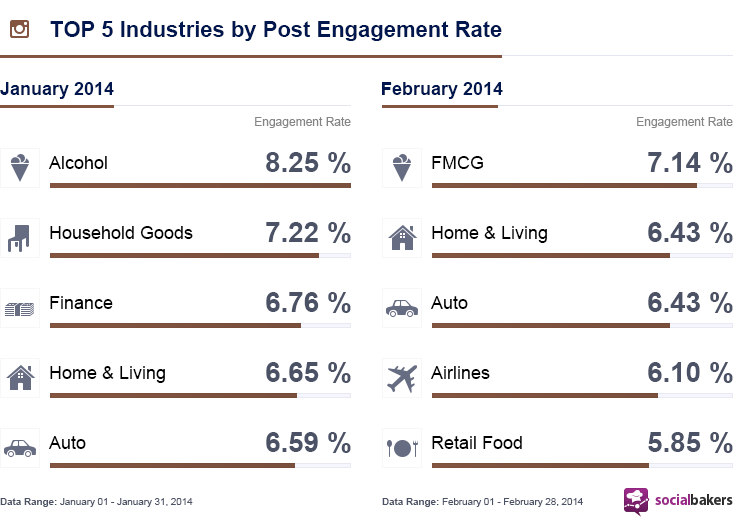 According to Socialbakers’ latest Instagram performance report, FMCGs and Home goods are leading the way. However the results also show some kind of seasonality. Indeed,while alcohol brands generated the most engagement on Instagram in January, the industry dropped off the top five by February. In its report, Socialbakers also pointed out two other Instagram accounts that are surfing on the engagement wave: General Electric and National Geographic. National Geographic dips into its high-quality photography from the magazine, giving Instagram followers a look through the lenses of the magazine’s photographers. GE actually invited six influencers and six fans to come up with a marketing campaign. It does seem rather simple in fact. If you want to be successful on Instagram you really need to share beautiful visual content that represents your brand and get your fans to do the rest for you. What do you think? Is there any specific brand Instagram account that impressed you lately?